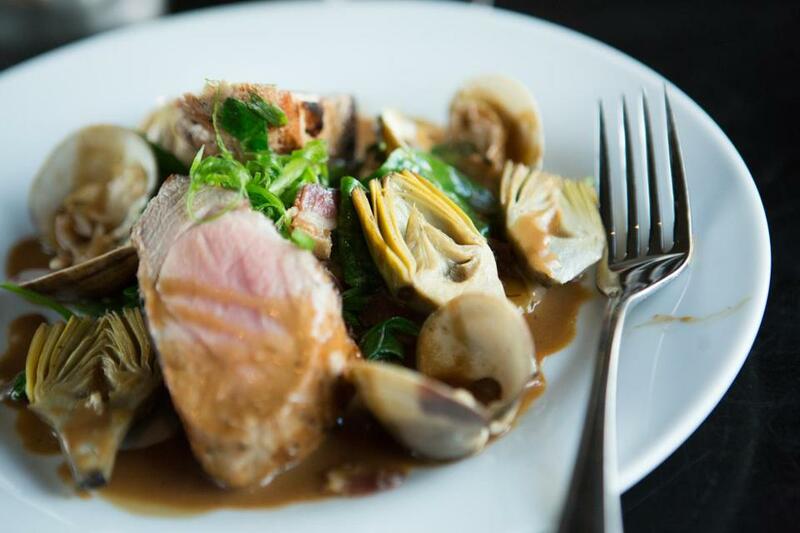 At Moonshine 152, from chef-owner Asia Mei, grilled pork tenderloin is served with clams, baby artichokes, leeks, and bacon-spiked greens in mushroom broth. A neighborhood restaurant is only as good as its operators’ understanding of the neighborhood. Asia Mei, behind the new Moonshine 152, knows this corner of South Boston. She made it work when the place was Franklin Southie, part of the Franklin Restaurant Group, and she was in the kitchen. Now she returns to the location as chef-owner. Mei’s background is diverse, running from Hamersley’s Bistro to Whole Foods. Most recently, she was at Sam’s on the waterfront at the former Louis Boston. And she grew up in California, eating her mother’s fried rice and taco-stand fare. I’m not sure there’s another local chef whose experiences are channeled so clearly on the plate. Quinoa salad and edamame hummus, char siu chicken and Korean barbecue tacos, elegant pork and fish dishes, and burgers and butterscotch pudding all feel equally at home on the menu (contained in a three-ring binder with tabs marking the different sections, like a really cool class project). Strapping lads in caps and flannel, 20-somethings in office attire, and diminutive white-haired dames are all here for dinner and drinks. It’s a comfortable, unpretentious spot that accommodates many tastes. There’s an extensive cocktail list, featuring house inventions, classics, and drinks created by bartenders around town, a neat feature. The beer list is succinct, with a handful on tap, from Jack’s Abby to Miller. The wine list is longer, reasonably priced but not stocked with the carbon-copy selections some neighborhood restaurants default to. Another dish features crisp golden rice croquettes topped with rounds of omelet and blistered shishito peppers, a clever riff on a sushi bar standard. (The omelet could have more flavor.) A salad of conch with lots of crunchy celery and sliced black olives is reminiscent of Italian scungilli salad, except that it’s topped with tobiko. Moonshine 152’s version of Korean tacos has surprising finesse for something so messy. Made with barbecue short rib, Asian pear kimchi, and candied ginger aioli, they balance savory with the right notes of sweet. Some dishes resemble ones Mei featured at Sam’s. 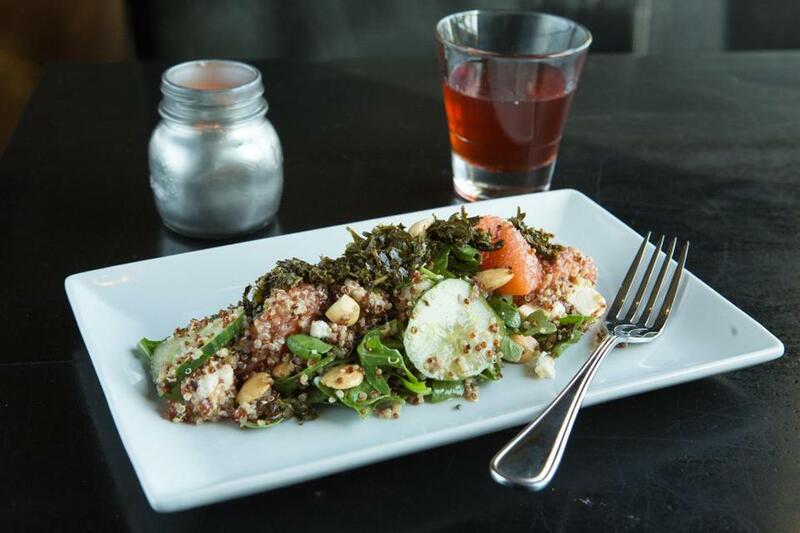 There is a salad of quinoa with grapefruit, almonds, cucumber, and feta that tastes as fresh as the version there, but with a Burmese accent of tea leaves. Baked halloumi is served with pickled strawberries (strange texture, nice flavor), harissa cashews, and pea tendrils. Hotter cheese would make this dish great. A salad of quinoa with grapefruit, almonds, cucumber, feta, and tea leaves. 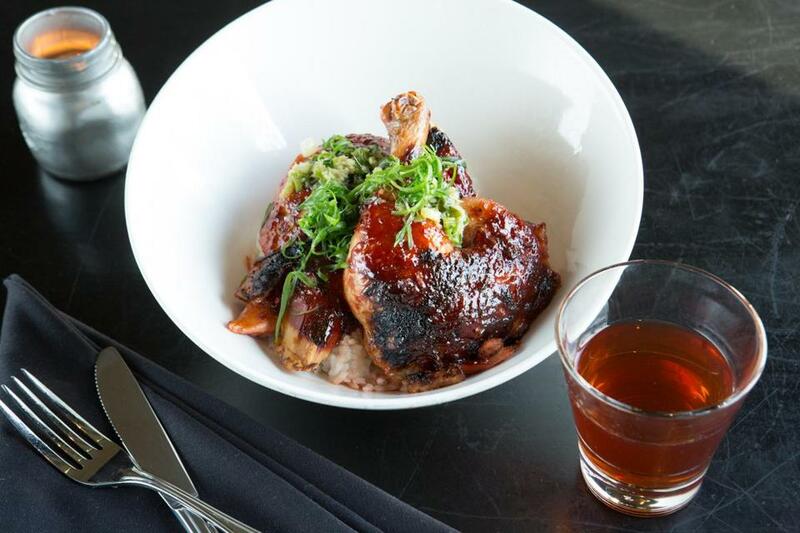 Char siu roast chicken, sticky and sweet, is complemented by bright green, ginger-spiked sauce and served over white rice, the kind of simple, pleasing dish that becomes a regular order. Grilled pork tenderloin, juicy and pink at the center, is served with clams, baby artichokes, leeks, and bacon-spiked greens in mushroom broth — a little bit homey, a little bit refined. One of the best dishes, from the restaurant’s opening in February, is a crisp, golden flounder fillet served over fried pickled green tomatoes with shrimp and uni-shrimp butter. It’s rich, spicy, and satisfying. Moonshine 152 doesn’t shortchange vegetarians. The winner right now is stuffed kohlrabi with “Riona’s favorite Irish curry,” potatoes, farro-almond tabbouleh, and raisins. The rich curry is hot and sweet and balanced, just right with the grains, nuts, and raisins. The kohlrabi is almost incidental. You may even have the dish delivered by Riona herself, one of Moonshine’s genuine, friendly servers. But a mushroom-tofu burger, very Whole Foods-esque, is less appealing. This is one of those veggie burgers for vegetarians who miss meat, a decent imitation of beef but not particularly nuanced in flavor. It tastes as dark brown as it looks. Char siu roast chicken with ginger-spiked sauce over white rice. Moonshine 152 doesn’t shortchange dessert, either. Mei and sous chef Danielle Gabriszeski know it doesn’t have to be elaborate to be good. 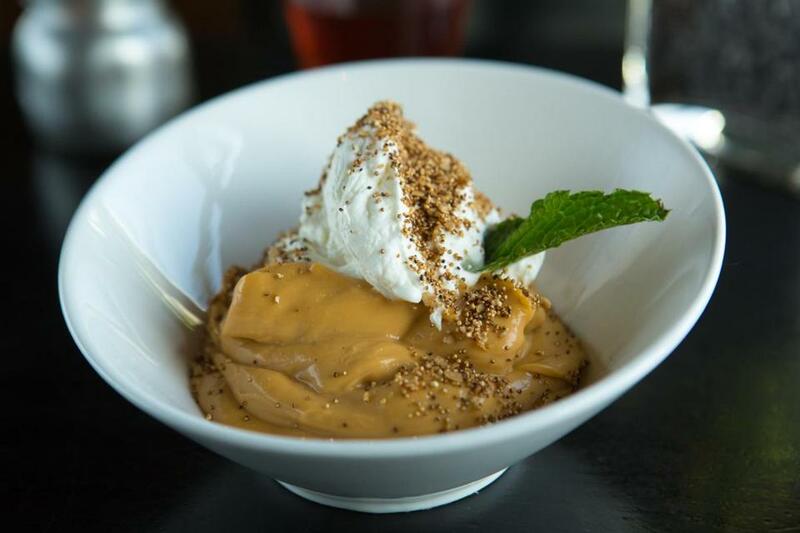 There’s a winning butterscotch pudding topped with Chantilly cream. And a coconut sorbet on the original menu, served with mango and candied ginger, was perfect, light and bright. I hope it reappears. On a night when I have more intestinal fortitude, I will return for the bacon brownie sundae. I’ll come late for dirty fried rice with Chinese sausage, duck liver, egg, and pickles. And brunch beckons — on Mondays, too — with lobster and grits, tater tot poutine, baked scrambled egg enchiladas, and a rotating special named for Ron Swanson of “Parks and Rec.” This is Southie’s version of Trina’s Starlite Lounge. Not all dishes are equal. Some bartenders mix a more-balanced New Classic or Jesse’s Girl than others. The decor is somewhat basic, like Franklin Southie with a few ailing succulents added here and there. But there’s a little open kitchen right at the front of the restaurant now, and Mei can be spotted through the window from the street. There is no better way to show that she and her restaurant are truly part of the neighborhood. Butterscotch pudding topped with Chantilly cream.